Lace has always been a favorite of brides. It is prized for its beautiful designs, romantic feeling, and fine needlework. 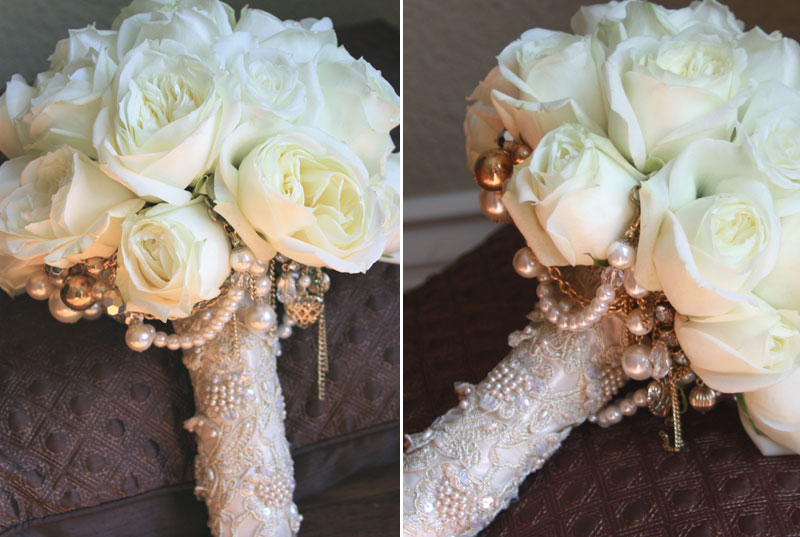 Whether you use a lot of lace or just a few accents, it will add a sense of luxury and elegance to your wedding. Of course the most obvious way to use lace in a wedding is on a bridal gown. There are a variety of different effects that can be created with lace, depending on which type is chosen, and how it is used. 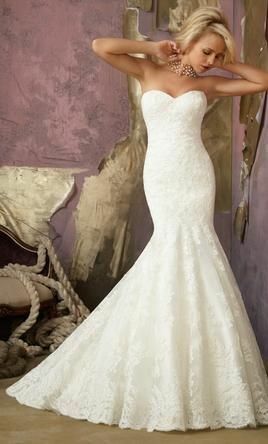 One of the most classic styles is to applique sections of Alencon or Venise lace to the bodice and hem of a wedding gown. For a fresh daytime look, keep the lace details delicate. If you prefer a more formal or grand effect, use a wider border of lace on the hem of the gown, and heavily bead it with crystal and pearl beads to match the bridal jewelry. In general, pearl bridal jewelry is considered to be the perfect companion to a traditional lace applique gown. A more modern take on a lace wedding gown is to use a piece of lace as fabric, rather than stitching smaller pieces to another material. The all-over lace bridal gown has become very popular, as it can be less fussy and busy than the more traditional lace applique method. When the lace is used in one continuous piece, at a distance, it reads as a textured fabric, which is why it is more streamlined than lace applique. This technique is gorgeous when done with a softer lace such as Chantilly, which flows beautifully. Finish it off with elegant pearl bridal jewelry or more glamorous crystal wedding jewelry. 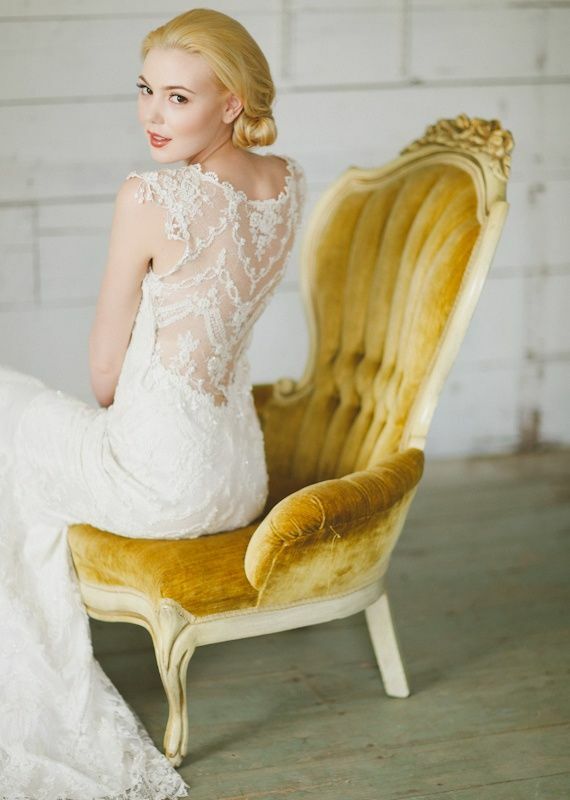 Lace is a beautiful addition to many parts of a wedding beyond the bride's attire. 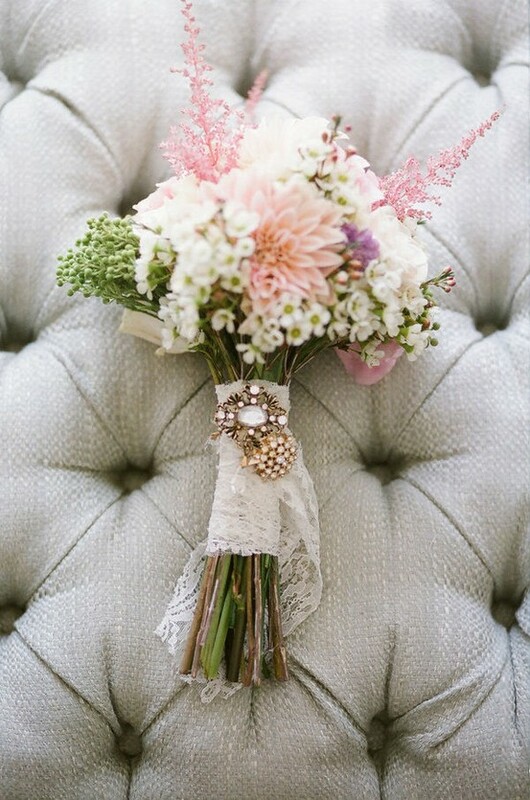 A romantic bouquet of roses or lily-of-the-valley would look amazing finished off with a wide lace ribbon. This idea would work equally well for the bridesmaids' bouquets, perhaps in a colored piece of lace. Another lovely way to use lace in your wedding ceremony is as a runner. 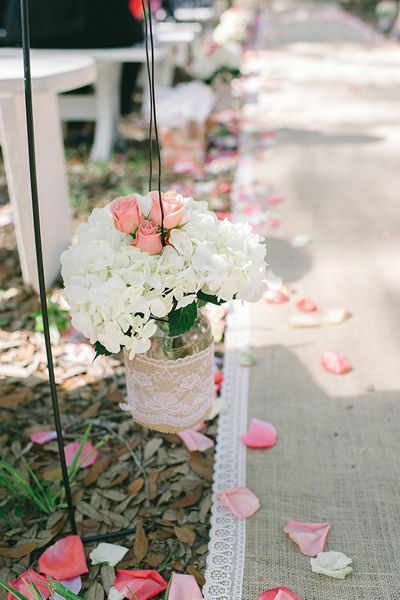 Lace aisle runners can easily be rented from your florist and create a very pretty path for the processional. 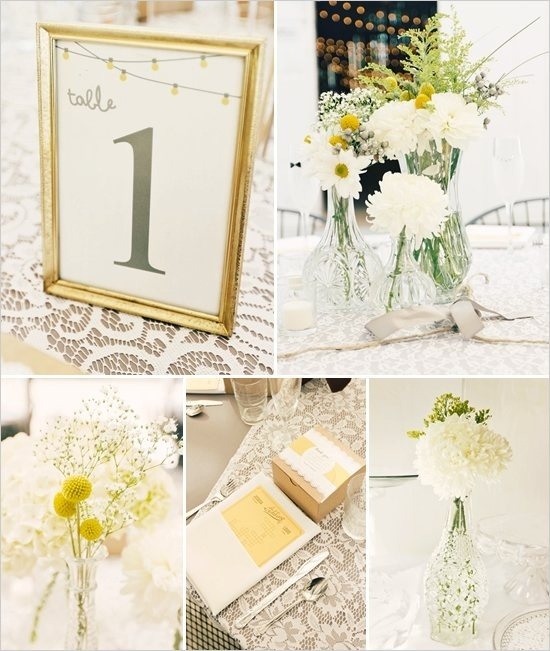 At the reception, lace is a wonderful accent for the tables. An ivory lace cloth laid over a solid tablecloth will look romantic and luxurious. For the solid underlayment, choose a color in a contrasting color to help showcase the design on the lace. Pale blue or yellow look fresh and summery under a crisp white lace; a deep tan color is elegant and understated when paired with an ivory lace. Some vendors also offer lace chair covers, but be wary of these; sometimes the chairs need covers because they are not pretty enough to be seen alone; in this case a solid chair cover makes a better camouflage. Small squares or circles of lace can used to wrap the wedding favors. 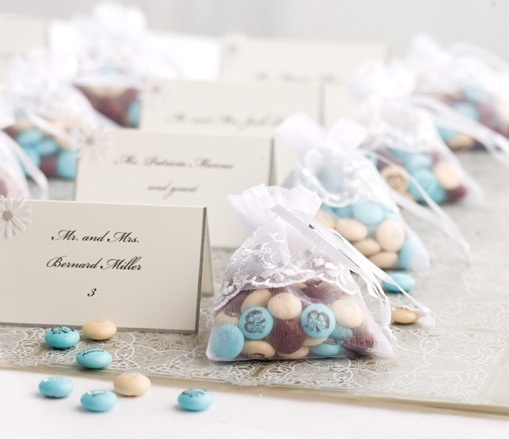 You can also purchase or make tiny lace drawstring bags, which are ideal for the classic wedding favor of chocolate candies. The lace squares would be pretty packaging for any type of favor, and are especially fitting for a country wedding. There are so many lovely ways to use lace in a wedding that it is no wonder that it has long been a staple for brides and their mothers. 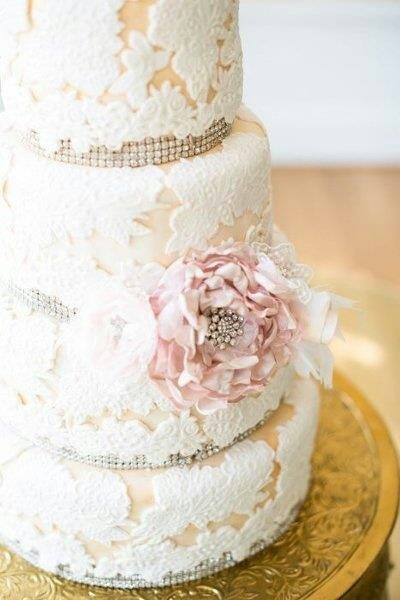 From gowns, to table linens, to cake designs, lace just adds such a soft and feminine touch. The timeless beauty of lace evokes the perfect romantic sentiment for a wedding day.